MOROCCO was more than I could have imagined! Inspiration of texture, design, pattern, light & craft… I mean INSPIRATION off the chain! 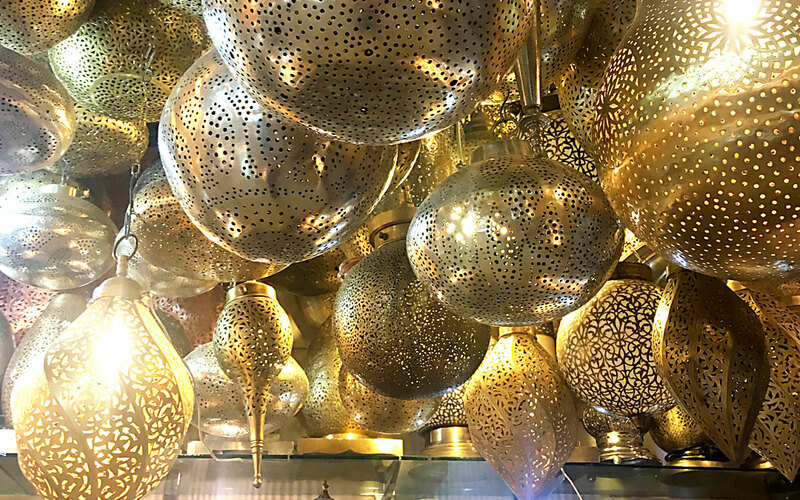 The food, the people, the traditions, the ancient Berber craft mixed with modern design, spices, fabrics, and perforated metal! OMG— be still my heart! Bringing my own glass back to Murano was super strange, and also an honor! Did the airline lady checking me in just ask if I was going to Venice for business or fun? I said that I was going to a glass conference as she was loading my suitcase on the rolling conveyor belt…”Is there glass in your bags?” ((NOOOOOO!)) ***Hell yes there is and don’t you dare open it!!! My copper glass pendant “NAVICELLA” installed for the illuminated show at Berengo Gallery on Murano during the GAS conference is now incorporated into the LUX LUMEN show on display from May til December as part of the Architectural Biennale 2018. Berengo Gallery is open for viewing on the island of Murano daily. In Venice, the Berengo Fondazione is open at Palazzo Franchetti for the Biennale.